The 1940 Roadmaster had a shorter wheelbase, was lighter, and was less expensive than the previous year’s model. The formal and fastback sedans were gone, but for the first time a 2-door coupe was available, which sold a respectable 3,991 units. Also new for this year, the coach-building firm of Brunn was asked to design several custom-bodied Buicks for the Series 70, 80 and 90. Only one Roadmaster example is known to have actually been produced in 1940, an open-front town car not surprisingly called the Townmaster. Overall sales more than tripled to 18,345. 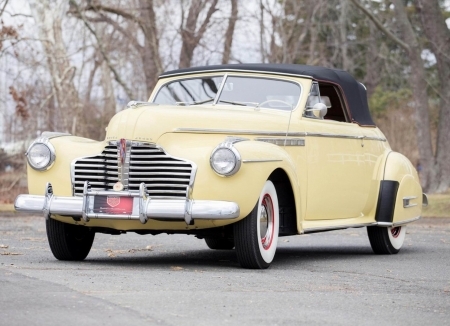 The styling changes for 1941 were modest, but the changes under the hood were major. The compression ratio was raised from 6.6:1 to 7.0:1, the "turbulator" pistons were redesigned, smaller spark plugs were substituted for the previous type and “Compound Carburetion” was introduced. Compound Carburetion was the forerunner of the modern four-barrel carburetor, and consisted of twin two-barrel carburetors. One unit operated all of the time, while the other operated only under hard acceleration. The new engine delivered 165 horsepower. With five more horsepower than a senior Packard, 15 more than any Cadillac, and 25 more than the largest Chryslers, it was the most powerful engine available that year on an American car. Marco_Ghostly Uploaded by Marco_Ghostly on Aug 13, 2017 . 1941 Buick Roadmaster Convertible - Desktop Nexus Cars Download free wallpapers and background images: 1941 Buick Roadmaster Convertible. Desktop Nexus Cars background ID 2292406. The 1940 Roadmaster had a shorter wheelbase, was lighter, and was less expensive than the previous year’s model. The formal and fastback sedans were gone, but for the first time a 2-door coupe was available, which sold a respectable 3,991 units. Also new for this year, the coach-building firm of Brunn was asked to design several custom-bodied Buicks for the Series 70, 80 and 90. Only one Roadmaster example is known to have actually been produced in 1940, an open-front town car not surprisingly called the Townmaster. Overall sales more than tripled to 18,345.